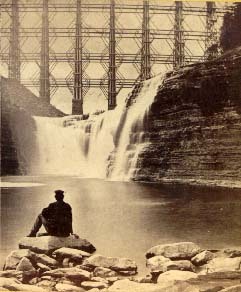 "No 59 Horse Shoe Falls - 70 Feet high - Genesee River, Portage, N.Y."
"E & H.T. Anthony & Co., New York"
This cabinet sized stereo image was taken from the river bed below the Upper Falls looking South. It shows the "Horseshoe" or Upper Falls and the impressive wooden towers of the Portage High Bridge.